What is Proteinuria During Pregnancy? How do doctors test for Proteinuria in pregnancy? Urine is a mix of waste urea, ions, water, and proteins too! A non-pregnant normal woman or human too secrets protein in the urine. Conception changes the urine composition doubling protein secreted in urine. 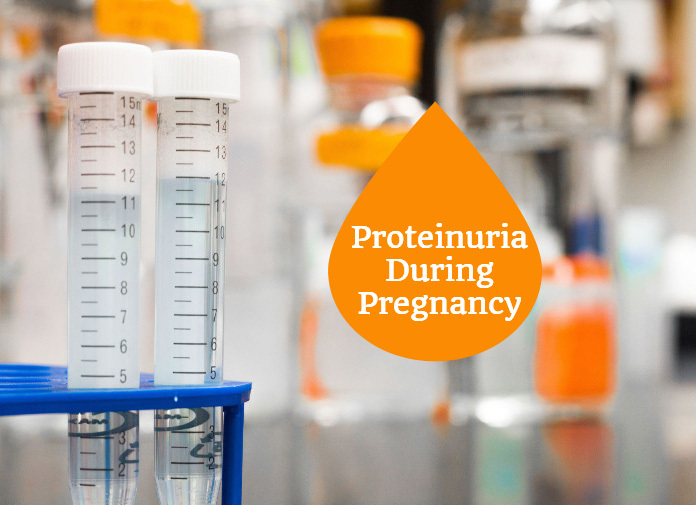 Proteinuria during pregnancy is the condition when the level of proteins increases beyond 300 mg/24 hours in urine. While a slight increase isn’t a cause to worry, higher levels of protein in the urine during pregnancy sign kidney disease. Inflammation of kidney or units inside it can hamper the reabsorption of protein from the urine produced. Kidneys produce urine in the smaller functional units and store them in collecting ducts. Depending on the change in ion balance and hydration reabsorb ions and water back. That’s the reason you not drinking water can help to avoid nature’s call for extended periods. Your kidneys are not 100% efficient in reabsorbing all the proteins back. At times some of the filtrate from blood reaching the kidneys may get proteins. Primarily it is albumin that escapes into the urine filtrate. When you are pregnant, the blood flow reaching the kidneys is higher than before pregnancy. As the speed of blood passing through kidney increases the error probability also increases. More proteins can slide past the filters of the kidney. Proteinuria in pregnant women also hints at impending complications in the course of pregnancy. Kidney dysfunction, infection or HELLP syndrome are some causes of the abnormal release of proteins in urine. Pregnancy hormones can alter the balance of solutes and fluids in the body. The osmolarity influences the filtering action of the kidney. Thus the essential biomolecules also start coming into the filtrate. During Pregnancy you have to give your urine samples all the time. You’ll be pro at understanding the medical terms they use and reports by the end. Prenatal appointments constitute a blood test and urinalysis as basics. Doctors test proteinuria to detect Preeclampsia in the second trimester by the time you’re midway. You may either have chronic proteinuria due to underlying kidney problems or onset proteinuria. The latter is because of preeclampsia, a condition that may occur in the second trimester. It is present even before pregnancy and results from a pre-existing kidney problem. Onset proteinuria develops during pregnancy. It is mainly caused due to preeclampsia which is also a pregnancy disorder characterized by high blood pressure and damage to body organs. There can be many causes of proteinuria while you’re pregnant. Ultimately it boils down to the reason that blood flow reaching to your kidney is unmanageable. Either it could be high blood pressure (preeclampsia) sending excess blood or compromised kidney. The lag on the part of either of them leads to leaking of essential protein albumin. Albuminuria during pregnancy further is the cause of swollen feet and other complications. A second-trimester complication Preeclampsia is sharply rising blood pressure. Proteinuria is a symptom and if often part of diagnostic tests. The condition of high blood pressure is harmful at every stage of pregnancy. Oxygen supply reaching baby reduces drastically. High blood pressure makes c section more probable. Doctors need to check preeclampsia and control the elevated BP. Prenatal tests involve the test in the 20th week even if you don’t have symptoms. A hypertensive state can lead to failure of organs and ultimately death during labor stress. A temporary form of diabetes during pregnancy is gestational diabetes. When your pregnancy comes to term, diabetes also vanishes. Unless the condition is severe nothing much to worry. People who have a family history of diabetes are more likely to suffer from gestational diabetes. However, the compromised blood sugar balance confuses the kidneys. They begin to filter out essential proteins too. They are common and curable but can cause other conditions which make pregnancy unmanageable. A urinary tract infection can spread to the kidneys leading to inflammation. When the kidneys have inflammation, their ability to filtration reduces. Even a normal blood pressure will be too much for the infected kidneys. Get a checkup when you have burning while urination, bleeding or irritation and pain. For UTI during pregnancy doctors use antibiotics that are safe. Make sure you replenish the lost good bacteria upon its use. Else the affected gut flora will reduce the synthesis of essential vitamins. Underlying kidney conditions may show up or deteriorate quickly due to excess work. Excess calcium or oxalate can cause renal calculi. You must be taking calcium supplements during pregnancy. Make sure you inform your doctor about any parathyroid problems. A problem in calcium balance can affect the kidneys making you prone to such secondary symptoms. A major cause of Proteinuria is the HELLP syndrome which is a combination of multiple symptoms. The abbreviated form stands for Hemolysis, elevated liver enzymes and low platelet count. Hemolysis refers to the breakdown of blood that affects the glomerular filtration in kidneys. The condition calls for immediate treatment as reducing platelet count can cause profuse bleeding. Pregnancy blood loss can jeopardize the life of both mother and baby. Earlier you may feel like you have preeclampsia when due to overlapping symptoms. Later perhaps through blood analysis or any incidence of bleeding HELLP diagnosis happens. Preeclampsia is a cause of HELLP syndrome. Along with proteinuria, HELLP can even cause severe birth defects and stillbirth. Getting treatment is possible provided you consult a doctor without delay. Emotional or environmental stress affects blood pressure and composition. There are dozens of side effects of stress. Unexplained proteinuria could be because of stress. Dehydration or high temperature and other surrounding factors can also cause kidney problems. When seizures or convulsions begin due to high blood pressure (Preeclampsia) the condition is eclampsia. It’s fatal and happens near the most critical stages of pregnancy – labor. You need medical intervention as soon as possible to control the situation. The level of protein secreting in urine goes abnormally high in this condition. Any Further the loss of proteins worsens the conditions, and a vicious cycle goes on until intervention. When your body starts producing more than the required amount of protein some of it may escape through urine. Conditions of protein misfolding or impaired extra synthesis are multiple myeloma and amyloidosis. There are many more such disorders. It’s less likely that a patient doesn’t know about them already. Overweight pregnant women are at risk of many pregnancy complications. Native Americans, Hispanics, African, and Asians are at higher risk. If a pregnant lady is over 45 years, she is at higher risk of having pregnancy Proteinuria. Your naked eyes cannot see protein floating in your urine. A urinalysis is essential for detecting proteinuria. Even if you cannot see protein in urine, your body gives you cues about having proteinuria. Swelling: The loss of proteins causes a change in blood concentration. Edema in pregnancy is mainly because of the change in fluid balance. Swelling causes leg cramps and pain all over the body. Puffy face and limbs along with urine changes could have proteinuria as its cause. Changes in the look of urine: Your urine may become straw colored and murky. At times you might have increased desire to pee and feel thirsty as water moves out along proteins. Foaming in urine also indicates the above. Preeclampsia symptoms: If you feel anxious and have excessive breathing rate you could be having preeclampsia. Other signs such as dizziness, headache, and vision changes also hint at changes in blood concentrations. Albumin is the main protein in the blood responsible for maintaining the osmolarity. Loss of albumin can be devastating for fluid balance and aggravate hypertensive conditions. Other signs of kidney disease, UTI: You will not see any distinct signs and instead only secondary symptoms if you’ve proteinuria. Pain near the kidney region or burning sensation while peeing hint at these causes. The tests remain the same for pregnant and non-pregnant women. Your kidney has a pace that tells the rate at which it filters in a unit of time. Analysis of a substance that doesn’t metabolize in the body and comes out 100% can tell the filtration rate of the kidney. Creatinine is the substance of choice that can assess renal function. The other name for the test is Urine Albumin to Creatinine Ratio. Two things are measured in the test, albumin and creatinine secreted in urine in 24 hours. Spot sample can be used too, but it won’t be as effective. When the amount of albumin coming out is more than 300 mg, and albumin to creatinine ratio is more than 30mg/g you have the condition. As for the test, nothing more than a urine sample of 24 hours is needed. You have to collect your urine throughout the day without contaminating the sample. The sample will go to the laboratory for testing, and you’ll get the reports. There are random sample tests and timed urine test for albumin. In times urine test you have to go after a particular duration of not peeing to give the sample. Just like your pregnancy test doctors have dip strips that are specific for testing albumin. After collecting your random or timed urine sample, they dip a strip in it. If the color changes, it implies there is protein in your urine. Often a dip strip is preceding test before the quantitative albumin to creatinine urinalysis. For treating proteinuria in pregnancy, the causes need to be controlled first. It’s essential for checking the infection spread to kidney or diabetes. Preeclampsia and Hypertension also need to be checked and brought under control. Doctors will prescribe you drugs whose names end in – sartan and angiotensin converting enzyme ACE inhibitors and angiotensin receptor blockers ACB. Both ACE inhibitors and ACB prevent the rise of blood by acting on angiotensin functions. Controlling the amount of protein in the diet is also an important step in quick healing. Check your weight and monitor the chronic conditions like diabetes. Previous articleCan You Become Pregnant Without Ovulation? Next articleConception Calculator: Can I Find Out The Exact Day Of Conception?